Tehran/Baghdad, Nov 13: Over 400 people were killed and thousands injured when a devastating 7.3 magnitude earthquake struck Iran in a region bordering Iraq, damaging hundreds of buildings and causing massive destruction. The death toll could rise, officials warned on Monday. Iran's state-run Islamic Republic News Agency (IRNA) news agency raised the death toll in the Sunday night earthquake to 407, making it the deadliest earthquake of 2017. At least 6,650 people were injured in the quake which occured at a depth of 33.9 km, Press TV reported. The tremors were felt in a wide area in the region including Turkey, Israel, Kuwait, Lebanon, Armenia, the United Arab Emirates and as far as Pakistan. Some 145 aftershocks were reported. Monday's death toll has overtaken the figure in September's Mexico City earthquake in which 369 people lost their lives. More than 70,000 people were in need of emergency shelter, the Iranian Red Crescent said. The hardest hit province was Iran's Kermanshah, where three days of mourning have been announced. A total of 236 people died in the town of Sarpol-e Zahab, 16 km from the Iraq border. The quake killed at least seven people in Iraq and injured 535, all in the country's northern, semi-autonomous Kurdish region, the Interior Ministry said. Any earthquake measuring over 7 on the Richter scale can cause widespread damage. The most extensive damage was in the town of Darbandikhan in the Kurdistan Region. Rescuers worked through the night to find people trapped in collapsed buildings in towns affected by the quake. Videos and images from Iran showed partially collapsed buildings and residents wrapped in blankets on the streets. Power cuts were reported in locations across western Iran. 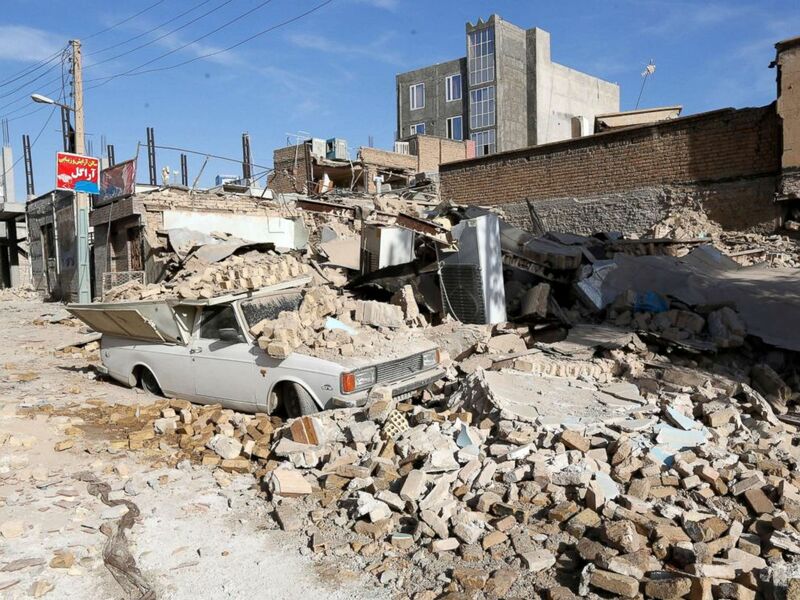 Some 30 aftershocks, including some of the magnitude-4.5, were felt in several Iranian provinces including Kurdistan, Khuzestan, Hamedan, western and eastern Azerbaijan as well as capital Tehran. Among the worst affected towns in Iran were Ghasr Shirin, Sarpul and Azgale although officials said it was still difficult to evaluate the extent of the destruction in the remote mountainous areas where roads and telephone lines were badly damaged. "There has been no help yet, neither food nor water, no clothing, no tents, there is nothing," said an Iranian man in his 30s, standing on a street with collapsed buildings. "There are no facilities. We've slept outside since last night. This is the condition of our homes. Our electricity, water, gas, phone lines are out, everything is completely out, the whole city has been destroyed, it is wrecked," he said. An image posted on social media showed Iranian soldiers searching through the rubble at night without flashlights or torches, using their cellphones for light. Some relief camps were set up to accommodate the afflicted people. Iran's Revolutionary Guard were reportedly travelling to the affected areas to help with rescue efforts, the semi state-run Tasnim news agency reported. Indian Prime Minister Narendra Modi and several world leaders including Russian President Vladimir Putin, Canadian Prime Minister Justin Trudeau and UN Secretary-General Antonio Guterres issued condolence messages. Pope Francis also sent two messages, offering prayers for those who lost their lives. Iran is one of the most seismically active countries in the world, being crossed by several major fault lines that cover at least 90 per cent of the country. The deadliest quake in Iran's modern history happened in June 1990, killing an estimated 37,000 people. An earthquake in the city of Bam in December 2003 killed 26,000 people.